Across the affluent, established democracies of North America and Western Europe, the last years have witnessed a meteoric rise of figures who may not be quite so brash or garish as Trump and yet bear a striking resemblance to him: Marine Le Pen in France, Frauke Petry in Germany, Geert Wilders in the Netherlands, and many of the leading Brexiteers in the United Kingdom. They too harness a new level of anger that is quite unlike anything liberal democracies have witnessed in a half- century. They too promise to stand up for ordinary people, to do away with a corrupt political elite, and to put the ethnic and religious minorities who are now (supposedly) being favored in their rightful (subordinate) place. They, too, are willing to do away with liberal political institutions like an independent judiciary or a free, robust press so long as those stand in the way of the people’s will. Together, they are building a new type of political regime that is slowly coming into its own: illiberal democracy. What are we to make of this phenomenon, and how ought we to respond to it? Indeed, is its very identification as ‘illiberal democracy’ at all useful, or is it rather part of the very problem that many of its critics wish to understand and to combat? These are powerful objections to the concept of ‘illiberal democracy.’ I share the aversion to the evolving authoritarianism being practiced in Poland, Hungary, Turkey and elsewhere, and I also share a commitment to liberal democratic values and practices. Words do matter. And it is troubling to allow Orbán, Kaczyński, Erdoğan or even Putin to claim the mantle of ‘democracy.’ To the extent that this implies any kind of sympathetic understanding much less endorsement, it seems more appropriate simply to deny such leaders the imprimatur of ‘democracy,’ and to place their authoritarianism front and centre. At the same time, I believe it is a mistake simply to dismiss the idea of ‘illiberal democracy’ because it is mobilized for objectionable political purposes. It may be distasteful. It might echo earlier efforts to invoke ‘democracy with adjectives’ on behalf of oppressive and sometimes murderous policies. But this is precisely why we must take it seriously as a rhetoric and a political project that has real traction in the world. It is true that after 1989, it was possible to declare, as Philippe Schmitter and Terry Karl did in Journal of Democracy, that: ‘The wave of transitions away from autocratic rule. . . has produced a welcome convergence towards a common definition of democracy. Everywhere there has been a silent abandonment of dubious adjectives like “popular”, “guided”, “bourgeois”, and “formal” to modify “democracy”. At the same time, a remarkable consensus has emerged concerning the minimal conditions that polities must meet in order to merit the prestigious appellation “democratic”.’6 But it is equally true that this consensus about ‘democracy without adjectives’ was always contested, and it was rather short-lived, and it has recently been eroded. The challenge facing supporters of liberal democracy is to take the full measure of this erosion, so that it can better be countered. In that sense we do need to re-litigate the arguments from 40-50 years ago about what to make of illiberal appeals to ‘popular sovereignty’ and ‘democracy.’ I wish it were not the case. But it is. And the reason why is because throughout Europe and in the US leaders are rising to power, through at least quasi- ‘democratic’ means, and claiming to stand for and to institute an illiberal form of ‘democracy.’ We need to oppose them. And part of that means ‘litigating’ the ideological contest that they are pursuing, i.e., to bring a ‘suit’ against them, to take seriously their arguments and to demonstrate rather than simply assert that their claim to ‘democracy’ ought to be rejected. In what follows I would like to outline a more careful approach to the topic and explain why I think it is both analytically and normatively important to proceed in such a manner. I want to suggest that instead of discarding the idea of ‘illiberal democracy,’ we ought to distinguish between at least three ways that this term needs to be understood: (1) as a form of justificatory praxis or legitimation that warrants understanding though not embrace, precisely because an essential element of political analysis is understanding the terms, symbols, and self-understandings of political actors and the ways that these ideas resonate with publics, whether we like these terms and symbols or not; (2) as a social scientific concept that registers a political aspiration or project but does not thereby offer an adequate conceptualization of the political consequences of this aspiration or project; and (3) as a normative commitment that ought to be criticized by those who take the values of individual autonomy and political pluralism seriously. And I want to suggest that only by fully grappling with these different uses can we take the full measure of the challenge that ‘illiberal democracy’ presents to a more pluralistic and egalitarian liberal democracy that is worthy of our support. It is too easy to simply dismiss the rhetoric of ‘illiberal democracy’ as a fraud, and doing so inhibits both proper understanding of the phenomenon and its appeal, and proper normative critique. My point is not that it is wrong to denounce adherents of ‘illiberal democracy’ as ‘authoritarian’ or to claim that such actors threaten ‘democracy.’ There surely are many practical situations where this kind of rhetoric makes perfect sense. Mass politics is not a graduate seminar, and rhetorics of denunciation play an important role in democratic politics. My point is that we ought to proceed with a proper sense of care. And the assertion that what goes under the heading of ‘illiberal democracy’ is simply hostility to democracy itself is too simplistic. Indeed, we need to better clarify the different meanings of ‘democracy’ precisely so that we can better appreciate the strengths and limits of the liberal democracy that is worthy of our intellectual and political support. The idea of ‘illiberal democracy’ is not new. In political science it was probably thrust into prominence with the 1997 publication of Fareed Zakaria’s Foreign Affairs essay ‘The Rise of Illiberal Democracy.’7 While the downfall of communism in 1989 seemed to cap a ‘wave’ of democratic transitions, Zakaria’s book gave voice to a growing concern among commentators that the toppling of the old regimes and their replacement by electoral systems did not necessarily herald the emergence and consolidation of liberal, representative democracies. Zakaria popularized an insight developed by a great many political scientists facing the limits of ‘transitology’: that there was emerging a range of ‘hybrid regimes’ that seemed to correspond neither to conventional understandings of liberal, representative democracy nor to authoritarianism.8 But this literature was interested primarily in the practices of elites and regimes that adverted to electoral legitimacy, and not really in the ideas motivating this appeal to electoral legitimacy, and certainly not in the justification of such appeals. …the defining aspect of today’s world can be articulated as a race to figure out a way of organizing communities, a state that is most capable of making a nation competitive. This is why, Honourable Ladies and Gentlemen, a trending topic in thinking is understanding systems that are not Western, not liberal, not liberal democracies, maybe not even democracies, and yet making nations successful. Today, the stars of international analyses are Singapore, China, India, Turkey, Russia. And I believe that our political community rightly anticipated this challenge. And if we think back on what we did in the last four years, and what we are going to do in the following four years, then it really can be interpreted from this angle. We are searching for (and we are doing our best to find, ways of parting with Western European dogmas, making ourselves independent from them) the form of organizing a community, that is capable of making us competitive in this great world-race. . . In order to be able to do this in 2010, and especially these days, we needed to courageously state a sentence, a sentence that, similar to the ones enumerated here, was considered to be a sacrilege in the liberal world order. We needed to state that a democracy is not necessarily liberal. Just because something is not liberal, it still can be a democracy. Moreover, it could be and needed to be expressed, that probably societies founded upon the principle of the liberal way to organize a state will not be able to sustain their world-competitiveness in the following years, and more likely they will suffer a setback, unless they will be able to substantially reform themselves … we have to abandon liberal methods and principles of organizing a society, as well as the liberal way to look at the world. … in the past twenty years the established Hungarian liberal democracy could not achieve a number of objectives. I made a short list of what it was not capable of. Liberal democracy was not capable of openly declaring, or even obliging, governments with constitutional power to declare that they should serve national interests. Moreover, it even questioned the existence of national interests. It did not oblige subsequent governments to recognize that Hungarian diaspora around the world belongs to our nation and to try and make this sense of belonging stronger with their work. Liberal democracy, the liberal Hungarian state did not protect public wealth. In defending himself in this way, Putin was also drawing on the arguments made by Vladislav Surkov, his chief ideologist of the time, who insisted that: ‘Our Russian model of democracy is called sovereign democracy. . . We want to be an open nation among other open nations and cooperate with them under fair rules, and not be managed from outside.’12 For Surkov, such a ‘sovereign democracy’ is distinguished by its sovereignty, in other words by its policing of clear boundaries separating it from ‘outside’ influences and especially Western, liberal conceptions of democracy: ‘I would like to say, that our project is a commonplace one. I would name it briefly as a “sovereign democracy.” It is not good to add something to democracy because a third way issue appears. But we are forced to do that because liberal politicians consider the sovereignty issue as not actual. I often hear that democracy is more important than sovereignty. We do not admit it. We think we need both. An independent state is worth fighting for.’13 While Surkov has remained an important figure in Putin’s orbit, the rhetoric of ‘sovereign democracy’ and its cousin, ‘managed democracy,’ has receded from public prominence as Putin has consolidated his hold on the Russian political system. At the same time, the general idea of ‘illiberal democracy’ has clearly continued to gain traction in many parts of the world and especially in parts of post- communist Europe, as a justification for political agendas of nationalists seeking to use electoral means to achieve legislative majorities, to capture important state institutions, and to use them to permanently marginalize political oppositions. But while such formulations may well be objectionable, are they thus contrary to the very meaning of democracy? We could simply stipulate that only ‘liberal democracy’ qualifies as ‘authentic’ democracy, and all other conceptions, ideological formulae, and legitimations are simply fraudulent, or ‘pseudo-democratic.’ But I think this is a mistake, a verbal sleight of hand. First, it is a historical mistake. If repression of pluralism attacks the very foundations of democracy (and not simply of liberalism or liberal democracy), then what do we make of the conceptions of ‘totalitarian democracy’ once analysed and lauded by Carl Schmitt, and analysed and despised by Jacob Talmon? Leninism was centred on a theory of ‘revolutionary proletarian democracy,’ and fascism too, in its Italian and Nazi variants, claimed to institute the ‘people’s will.’ Before 1945 these anti-liberal appropriations of democracy were powerful ideologies, and indeed it was only in struggle against these populistic ideologies that a distinctive praxis of liberal democracy eventually emerged. And throughout the entire period of the Cold War, the discourse of ‘people’s democracy’ pervaded the countries of the Soviet bloc (paralleled in the ‘People’s Republic of China’ and ‘Democratic People’s Republic of [North] Korea’). Muller knows this. It is a central thesis of his fine 2011 book Contesting Democracy: Political Ideas in Twentieth-Century Europe. But even in this book there is some ambivalence. For while Muller acknowledges that these ideologies ‘played on the register of democratic values’ and ‘promised fully to realize values commonly associated with democracy,’ he also insists that ‘they were not democracies by any stretch – though, as we shall see, many defenders of these regimes did engage in strenuous conception stretching precisely to make that claim plausible.’15 But in fact, as he himself points out, postwar liberal democracy was defined in opposition to these dictatorial regimes that claimed the mantle of ‘authentic’ democracy. I surely agree with Muller that from the perspective of liberal democracy as a historical achievement and a normative value – a perspective I share! – the Stalinist and fascist regimes were dictatorial, tyrannical, brutal, even evil. And they were surely hostile to liberal democracy. And there is thus good reason to have been, and to be, hostile to them. But only from the vantage point of liberal democracy can their partisans be ruled out as not authentically democratic in a semantic and ideological sense. 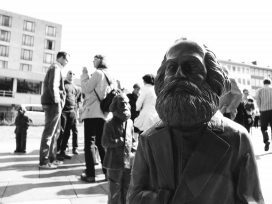 For much of the history of the 20th century, such ideologists offered alternative conceptions – dangerous alternatives to be sure – of democracy, ones that were plausible to many people, perhaps even more plausible and compelling than liberal democracy was until WWII and its aftermath. This, again, is the central theme of Muller’s book – that contestation over the value and indeed the very meaning of ‘democracy’ defined the politics of the century. The totalitarian regimes, in short, represented lethal, and morally and politically objectionable, efforts (mutations?) to institute a kind of anti-liberal, populistic democracy. They were hostile to liberal democracy – in part, in the name of an alternative conception of democracy. It is very awkward to speak in this way, to be sure. But it is also necessary. As Muller himself writes in his book: ‘Though few people, to put it mildly, would nowadays defend the Nazis’ “Germanic democracy” or the postwar Eastern European “people’s democracies,” it is not superfluous to say that most of the “democratic promises” of the extreme anti-liberal regimes were disingenuous (or, at the very least, dysfunctional in practice). But it is also important to ask why these regimes felt compelled to make these promises in the first place.’16 It is important to ask this. And the answer is plain: because ‘liberalism’ was in crisis, and it had always been in tension with ‘democracy,’ and because ‘democracy’ had a range of meanings that were the topic of hot and cold contention. And understanding the ideological underpinnings of these alternative conceptions was and is essential to better contesting them in the name of liberal democratic values. But why deny that they offer a version of ‘popular sovereignty,’ and thus of ‘democracy,’ even if their version would seek to transform an electoral victory into a permanent mandate to rule in the name of ‘the people’ or ‘the nation’ – an objectionable version of ‘democracy’ to be sure, and even an authoritarian one? Denying that this is an interpretation of ‘democracy,’ even if an objectionable interpretation, makes it difficult to understand the ideological struggles of the 20th century. And it also makes it difficult to understand the popular, demotic source of the contemporary appeal of the Orbáns and Trumps of our world. For a great many right and left populists do ‘play on the register’ of democratic values, and challenge real deficiencies of liberal democracy, and claim to promote a more authentically popular mode of representation. And understanding what they are doing with words, and how their words are resonating, is essential to understanding their power. The question of their ‘sincerity’ – whatever this might mean, and however much this might be gauged – is beside the point. As Robert Michels’ noted a century ago in his Political Parties, ‘our age has destroyed once and for all the ancient and rigid forms of aristocracy, has destroyed them, at least, in certain important regions of political constitutional life. Even conservatism at times assumed a democratic form. Before the assault of the democratic masses it has long since abandoned its primitive aspect, and loves to change its disguise … In an era of democracy, ethics constitute a weapon which everyone can employ … Today, all the factors of public life speak and struggle in the name of the people, of. the community at large. The government and rebels against the government, kings and the party-leaders, tyrants by the grace of God and usurpers, rabid idealists and calculating self-seekers, all are ‘the people,’ and all declare that in their actions they merely fulfil the will of the nation. Thus, in the modern life of the classes and of the nations, moral considerations have become an accessory, a necessary fiction.’17 As Michels makes clear, modern politics is in large part defined by competition for the banner of ‘democracy.’ It is not a question of sincerity. It is a question of contested meaning. To stipulate by semantic fiat that the justifications offered by Orbán et al are against not just liberal democracy but democracy itself is to refuse to take seriously the potent, if perhaps toxic, ideological brew that many millions of citizens are apparently eager to imbibe. To say that the discourse of ‘illiberal democracy’ is a real and politically effective mode of legitimation whose popular ‘logic’ and appeal ought to be understood as a dangerous variant of ‘democracy’ is one thing. But to say that the proponents of ‘illiberal democracy’ are in fact instituting ‘illiberal democracy’ as an accomplished fact, is another. Political theorists and social scientists are not required to accept the rhetoric of ‘illiberal democracy’ at face value. We are indeed obliged to analyse the rhetoric not merely as words or symbols, but as practices, linked to political initiatives, movements, parties, and efforts to legislate change. It is essential to appreciate that the social world is partly constituted by language, and that we do with words is important. But equally important is what we do with the words; and to get at that we need to go beyond the words themselves. Here, I would submit, the language of ‘illiberal democracy’ is problematic, and does suffer from a kind of ‘conceptual stretching’ that inhibits careful inquiry. For it condenses two questions that are related but also distinct. The first relates to the ways we characterize the aspirations of political agents. If Orbán, for example, declares that he seeks to bring about an ‘illiberal democracy,’ then one moment of analysis involves taking his declarations seriously and understanding what he means by ‘illiberal democracy.’ This requires analysing his uses of this term, the prior uses and meanings on which he draws, the contexts in which he rhetorically acts, and the political ‘uptake’ of his pronouncements among relevant publics. 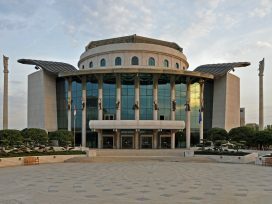 But it also involves unpacking the term into its likely practical ramifications: the transformation of state institutions to exalt ‘national unity’ over ethnic and political pluralism; the bringing of relatively autonomous judicial, educational and media institutions under partisan control; the policing and thus the harassment of contacts between domestic civil society institutions and transnational NGOs, IGOs, etc. These are the kinds of things that Orbán is doing or more accurately attempting to do with his invocations of ‘illiberal democracy.’ Does the simple assertion ‘Orbán seeks an illiberal democracy’ make sense? Yes. But it is a simple assertion, and it has little content, and we have every reason to be wary of such simple assertions, and to want more explanatory content than such assertions can provide. The second question to which the analytic invocation of ‘illiberal democracy’ often speaks is a question not about political aspiration but about regime type: have the changes instituted by ‘illiberal democratic’ aspirants actually resulted in a regime change, and if so, does the term ‘illiberal democracy’ constitute an adequate way of describing and classifying the new regime? It is in this vein that many journalists and commentators speak of the ‘rise of illiberal democracy,’ and that the Hungarian contributors to an important new volume intend in speaking of The Hungarian Patient: Social Opposition to an Illiberal Democracy.18 This way of talking is also nicely captured in the extended headline of a recent Nation piece by David Ost: ‘Regime Change Carried Out in Poland: Since Taking Office in November, the Law and Justice Party has Abandoned the Institutions of Liberal Democracy in the Pursuit of Raw Power.’19 There is, to be sure, some ambiguity in this title. On the one hand, this ‘abandonment’ of liberal democracy in pursuit of power is presented as a purpose of the Law and Justice Party. But on the other hand, it is presented as an accomplishment of this party since taking office three months before. There is, perhaps, an ambiguity and a fluidity to these unfolding developments that makes the term ‘illiberal democracy’ particularly suitable, as a way of denoting what some political scientists call a ‘diminished subtype’ of (liberal-pluralist) democracy, and what others might consider a ‘weak’ or ‘corrupt’ or ‘failing’ liberal democracy or as a liberal democracy suffering from diminishing quality. The basic approach was first outlined in John Gerring and Michael Coppedge’s ‘Conceptualizing and Measuring Democracy: A New Approach,’ published in 2011 in Perspectives on Politics. The piece proceeds from the lack of scholarly consensus about how to conceptualize, measure, and thus compare the ‘democratic’ character of regimes. As the authors note, this lack of clear agreement has both theoretical and practical consequences: ‘Without some way of analysing regime-types through time and across countries we have no way to mark progress or regress on this vital matter, to explain it, to reveal its consequences, or to affect its future course.’ They argue that the principal source of this lack agreement is the complexity and essential contestability of ‘democracy’ as a concept. They argue that ‘democracy’ is a ‘multivalent concept’ that typically comprises at least six distinct dimensions – electoral, liberal, majoritarian, participatory, deliberative, and egalitarian – and that explanatory theories ought to register these distinct dimensions. They describe their approach as ‘historical, multidimensional, disaggregated, and transparent,’ and conclude by considering some of the practical obstacles to its application and the ways these might be overcome. In short, following this approach, regimes are shifting targets of analysis; their understanding requires a range of concepts, distinctions, and qualifications; and it is unwise, if not impossible, to stipulate, in a simple or essentialist fashion, what is or is not ‘a democracy.’ And for this very reason, I would argue, the social scientific usefulness of the concept of ‘illiberal democracy’ can only be judged pragmatically. Does it help us to understand certain things about the political projects of contemporary antiliberal political leaders and movements and about the possible or probable changes being instituted in its name? Surely yes. 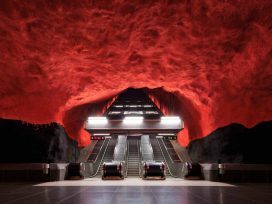 Does it have limits, and do the phenomena that the term seeks to capture also admit of other possible categorizations? Surely yes. In this sense, the only reasonable social scientific answer to the question ‘is there illiberal democracy?’ is qualified: there surely are phenomena that admit of this label, but whether or not this label suffices, or is the best label to apply, or is as suitable at one moment in time as it was at another, can only be determined by specific social scientific analyses and arguments. In the same way, whether a regime being led by an ‘illiberal democratic’ government has moved decisively toward a more fully-fledged authoritarian regime can only be determined by specific analyses and arguments. And there is no reason to expect a consensus on these questions any time soon. So I do not believe that the idea of ‘illiberal democracy’ ought to be discarded as useless or misleading or even exculpatory for antiliberals. It signifies something important that needs to be understood and analysed, as a kind of legitimation, as a political aspiration of self-described proponents of ‘illiberal democracy,’ and perhaps even as a very ‘diminished subtype’ of democratic regime. 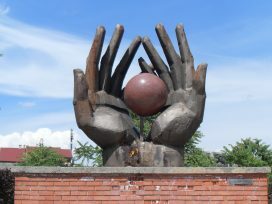 The best way for those of us who are committed to pluralist, liberal democracy – and to further deepening its institutional forms – to explain and defend what we value is to oppose the bad things done in the name of ‘democracy’ by carefully criticizing what is wrong with these interpretations of ‘democracy’ and offering a compelling defence of pluralist, liberal democracy. To claim that these bad things are not ‘really’ democracy at all is to play an essentialist semantic game.25 If such a game could work, it might be worth trying. But I doubt it can work. One reason is conceptual and historical. For, as theorists such as the late Claude Lefort recognized long ago, democracy is an inherently open and an essentially contested idea.26 That is why it is so widely claimed by so many political agents, some good and some very bad. There is no alternative, theoretically or politically, to continuing to participate in contesting democracy. This means understanding the elasticity of the democratic idea, and presenting compelling arguments for why any interpretation of democracy that rejects the centrality of civil freedom, pluralism, and contestation is a recipe for a dictatorship with a democratic veneer, and why in the modern world the only morally legitimate way of instituting democracy as an ongoing system of self-government at the level of the nation-state is through liberal democracy. But there is a second reason it cannot work, and this has to do not simply with the elasticity of the democratic idea, but with the limits of the practices and institutions that this idea has widely come to justify. There exists gender-neutral civic status, but also legally entrenched forms of patriarchy, especially in the domains of family law and the regulation of gender-based violence, and there also exists contestation of these patriarchal practices, and backlashes of resentment against these contests. Those of us who believe that liberal democracy is the only form of democracy consistent with civil freedom in the modern world have no choice but to understand both the strengths but also the practical and normative limits of liberal democracy; to engage, incorporate and agonistically compete with those social movements and political forces who challenge these limits in ways that are consistent with civil freedom and pluralism; and to oppose and hopefully defeat those forces that challenge these limits in ways that are hostile to civil freedom, political pluralism, and liberalism itself. While in this paper I have focused my attention on the self-styled discourse of ‘illiberal democracy’ associated with right-wing populists in Europe and the U.S., there are forms of left-wing populism, such as the ‘Bolivarian Revolution’ extolled by Hugo Chávez and his successor Nicolas Maduro, that also threaten liberal democratic political institutions, promising to supplant representative government and civil freedom with a more authentic, popular form of democracy.30 Such forms of anti-liberal populism feed off of the real failings of liberal democracy, and pose genuine challenges to it that proceed in part by promising a more authentic ‘popular sovereignty.’ The only way to defend liberal democracy in the face of these challenges is refute such promises, and at the same time to critique and to improve liberal democracy itself. This is a challenge at every level of politics, from the neighbourhood to the nation-state to transnational and global forms of governance. To return to the question that animates this essay: is there illiberal democracy? Yes. There is illiberal democracy, as an aspiration and a politics, and it is something to be understood and criticized by liberal democrats. At the same time, liberal democracy is not democracy itself. It is a partial and vulnerable form of democracy whose defence requires chronic contestation, extension, and deepening. This is not a matter that can be resolved through semantic fiat or through efforts to limit ‘conceptual stretching.’ For politics is conceptual stretching, normative contestation, and institutional power. The only ‘resolutions’ possible are political ones, and the only political ones worth supporting are ones that leave open the possibility of ongoing contestation, irresolution, and resolution. We political theorists and social scientists can best contribute to these ongoing contests by developing careful accounts of the range of meanings associated with important concepts like ‘illiberal democracy’ and of the justificatory discourses in which they figure; the actual forms of political contestation these discourses serve; the ways that these contests impact the distribution of political power and the consolidation, weakening, or undermining of pluralistic, liberal democratic political regimes; and the stakes of these contests for the diverse individuals and groups who together inhabit the political world. David Ost, ‘Thoughts on the Hungarian and Polish New Right in Power.’ Public Seminar (September 21, 2016), http://www.publicseminar.org/2016/09/thoughts-on-the-hungarian-and-polish-new-right-in-power/. Dani Rodrick and Sharun Mukand, ‘Why illiberal democracies are on the rise.’ Huffington Post (May 18, 2015), http://www.huffingtonpost.com/dani-rodrik/illiberal-democracies-on-therise_b_7302374.html, and Andrew MacDowall, ‘Illiberal Democracy: How Hungary’s Orbán is Testing Europe.’ World Politics Review (December 18, 2014). Yascha Mounk, ‘The Week That Democracy Died,’ Slate (August 14, 2016), http://www.slate.com/articles/news_and_politics/cover_story/2016/08/the_week_democracy_died_how_brexit_nice_turkey_and_trump_are_all_connected.html. ‘The Problem with ‘Illiberal Democracy’.’ Project Syndicate (January 21, 2016). Janos Kornai, ‘Vulnerable Democracies: An Interview with Janos Korn’ Hungarian Spectrum (December 29, 2016), http://hungarianspectrum.org/2016/12/29/vulnerable-democracies-an-interview-with-janos-kornai/. Philippe C. Schmitter and Terry Lynn Karl, ‘What Democracy Is... And Is Not.’ Journal of Democracy (Summer 1991). Fareed Zakaria, ‘The Rise of Illiberal Democracy.’ Foreign Affairs (November/December 1997), pp. 22-43. See also his later book The Future of Freedom: Illiberal Democracy at Home and Abroad (New York: W.W. Norton, 2003). Many of these themes were also raised in Vladimir Tismaneanu’s important Fantasies of Salvation: Democracy, Nationalism, and Myth in PostCommunist Europe (Princeton 1998). See, for example, Steven Levitsky and Lucan Way’s ‘The Rise of Competitive Authoritarianism.’ Journal of Democracy (April 2002). 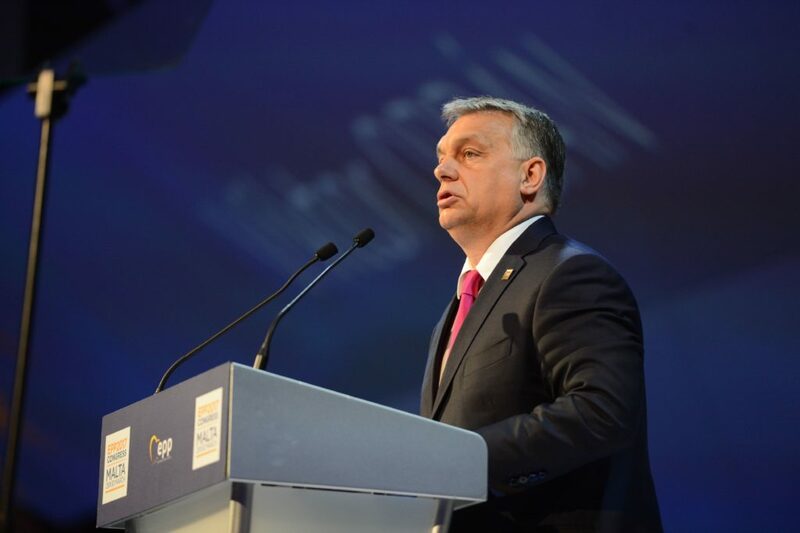 Full text of Viktor Orbán’s speech at Băile Tuşnad (Tusnádfürdő) of 26 July 2014 available at: http://budapestbeacon.com/public-policy/full-text-of-viktor-Orbáns-speech-at-baile-tusnadtusnadfurdo-of-26-july- 2014/10592. Erin K. Jenne and Cas Mudde, ‘Hungary’s Illiberal Turn: Can Outsiders Help?’ Journal of Democracy, vol. 23, no. 3 (July 2012). Vladislav Surkov, Deputy Chief of Staff of the President of the Russian Federation, June 29, 2006, at http://www.kommersant.com/page.asp?id=686274. Vladislav Surkov, ‘How Russia Should Fight International Conspiracies.’ (November 29, 2006), http://www.networkcom/Forum/155335/thread/1164815166/last-1164815166/Vladislav+Surkov%C2%92s+Secret+Speech-+How+Russia+Should+Fight+International+Conspiracies. Peter Krastev and Jon Van Til, eds., The Hungarian Patient: Social Opposition to an Illiberal Democracy (CEU Press, 2015). See also Janos Kornai, ‘Hungary’s U-Turn: Retreating from Democracy.’ Journal of Democracy, vol. 26, no. 3 (July 2015). David Ost, ‘Regime Change in Poland, Carried Out from Within.’ Nation (January 8, 2016). Rick Noack, ‘Polish Women Go On Nationwide Strike Against Abortion Ban.’ Washington Post (October 3, 2016), https://www.washingtonpost.com/news/worldviews/wp/2016/10/03/polish-women-go-on-nationwide-strike-against-proposed-abortion-ban/?utm_term=.5fdf280d3ae3. Patrick Kingsley, ‘Hungary’s Referendum Not Valid After Voters Stay Away.’ The Guardian (Sunday, October 2, 2016), https://www.theguardian.com/world/2016/oct/02/hungarian-vote-on-refugees-will-not-take-place-suggest-first-poll-results. See John Connelly, ‘Central European University Under Attack.’ Nation (April 12, 2017), https://www.thenation.com/article/central-european-university-under/; ‘The Anti-EU, Anti-Soros Campaigns Continue with Renewed Vigor.’ Hungarian Spectrum (April 30, 2017), http://hungarianspectrum.org/2017/04/30/the-anti-eu-anti-soros-campaigns-continue-with-renewed-vigor/ ; and ‘As Far as Hungarian State Television is Concerned, Soros is an Evil Zionist.’ Hungarian Spectrum (May 26, 2017), http://hungarianspectrum.org/2017/05/26/as-far-as-hungarian-state-television-is-concerned-soros-is-an-evil-zionist/. John Gerring, Michael Coppedge, et al., ‘Conceptualizing and Measuring Democracy: A New Approach.’ Perspectives on Politics (June 2011), pp. 247-6, https://www.cambridge.org/core/journals/perspectives-on- politics/article/conceptualizing-andmeasuring-democracy-a-new-approach/DAF249E74DDD3ACE3FFC96F20EE4074D. A similar argument is developed by Richard Youngs in ‘Exploring Non-Western Democracy.’ Journal of Democracy, vol. 26, no. 4 (October 2015), pp. 140-54. Claude Lefort, The Political Forms of Modern Society (MIT Press, 1986). See Justin Gest, ‘Why Trumpism Will Outlast Trump Himself.’ Politico (August 16, 2016); John Feffer, ‘Donald Trump is not the Presidential Candidate We Should Be Worried About.’ Nation (June 27, 2016); and Farai Chideya, ‘What Can Europe’s Far Right Tell Us About Trump’s Rise?’ FiveThirtyEight (May 18, 2016), http://fivethirtyeight.com/features/what-can-europes-far- right-tell-us-about-trumps-rise/. Sławomir Sierakowski, ‘The Illiberal International.’ Public Seminar (September 14, 2016), http://www.publicseminar.org/author/ssierakowski/. Ivan Krastev, ‘What’s Wrong with East-Central Europe: Liberalism’s Failure to Deliver.’ Journal of Democracy, vol. 27, no. 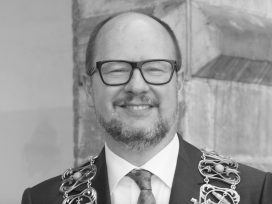 1 (January 2016), pp. 35-39. 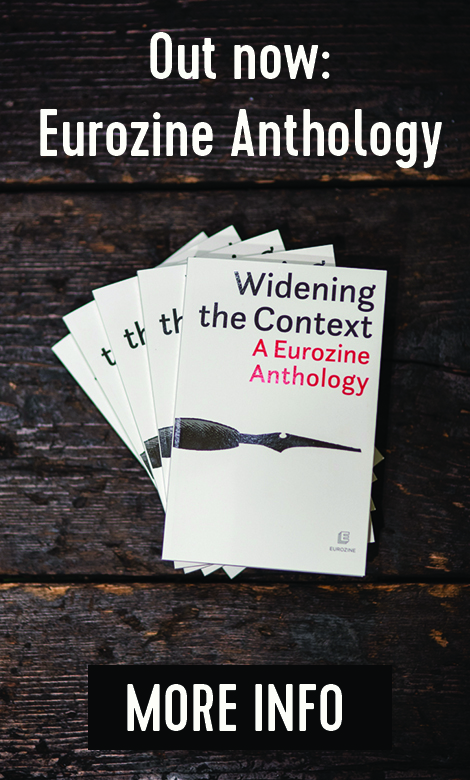 Krastev is writing in response to James Dawson and Sean Hanle’s ‘What’s Wrong with East-Central Europe: The Fading Mirage of Liberal Consensus,’ in the same issue. The disagreements between these authors are interesting but minor, and the entire exchange is consistent with the point I am making here about how the weaknesses of liberal democracy are being contested on the terrain of democracy itself. 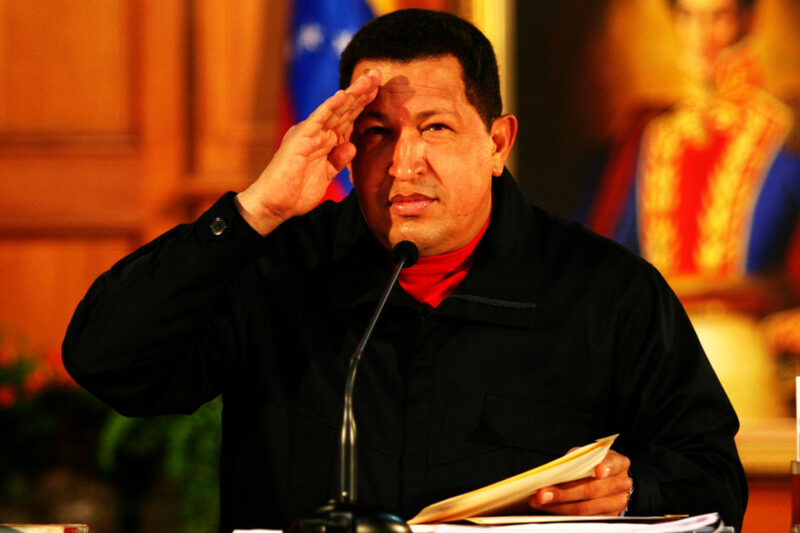 In his widely quoted 2006 Speech to the 6th World Social Forum, for example, Chávez extolled: ‘the union of our people, of all the tendencies of indigenous, workers, campesinos, intellectuals, professionals, women, students, all the ecological tendencies, all those who fight for real human rights, those who fight for justice, equality, dignity. All of us must unite; join together in a victorious offensive against the empire. . . the Bolivarian Revolution’s advancements in education, in health, in the fight against misery, against poverty, in the transformation of the economic model of the 20th Century, in the promotion of a promotion of a new society of equals, where no one is excluded, in the promotion of a new political model: revolutionary democracy, participatory and protagonistic democracy, where the people are the essence and the fundamental actor in the political battle, instead of an elite that represents the ‘people,’ representative democracy always ends up being democracy of the elites and therefore a false democracy. The only democracy that we believe in is the people’s democracy, participatory and protagonistic, charged by popular force, by popular will...’ Hugo Chávez, ‘Speech to the 6th World Social Forum’ (May 5, 2006), https://venezuelanalysis.com/analysis/1728. The author would like to thank the following for comments on the paper: Oana Baluta, Andras Bozoki, Michael Bernhard, Larry Diamond, Nic Dobrei, Alina Drogolea, Jeffrey Goldfarb, Bogdan Iacob, Ciobaratu Iulia, Erin Jenne, Micheline Ishay, Rafael Khachaturian, Adrian Miroiu, Mihaela Miroiu, Cas Mudde, David Ost, Takis Pappis, Liliana Popescu, Bill Scheuerman, and Vladimir Tismaneanu. He would also like to thank Jeffrey Goldfarb, Claire Potter, Dara Levendosky, and Zach Sunderman for their editorial work on this paper when it first appeared at Public Seminar. 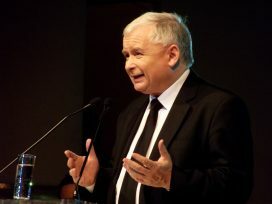 Jarosław Kaczyński. Photo: Piotr Drabik.